I would like to give a rebuttal to “The Armchair Mayor’s” reply today about accidents on the Coquihalla Highway. He is implying that adding a toll will make the highway safer. This is a lie and a scam. I was involved in an accident back in February of 1991. It was purely the result of poor maintainence. There was a toll on the highway then. I am originally from Reno, Nevada. We had the Donner pass between Reno and San Francisco. Over there they have California Highway patrol set up on each end of the hiway. EVERY car is inspected as it drives through the chain control area. No chains or winter tires, you don’t get back on the hiway. It is a simple solution. No all-season tires during any serious snow storm. There are people there to put chains on automobiles. And people to take them off at the other end. That highway has 10 times the traffic and the highest pass is 6,800 or 7,800 feet. $1,000-$1,500 fines for semi’s that try to get by the road block. Chains are $300-$500 a set. This could be eliminated quite easily. We also need to set higher standards for the road contractors. If not, let’s go back to when the province and the Ministry of Highways did the road maintainence. 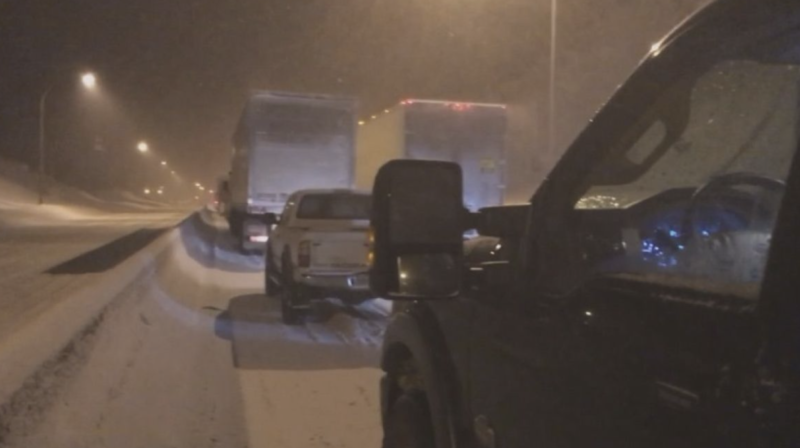 A toll will do nothing until the RCMP enforce chain and tire requirements during snow storms. The fault lies with a police force that doesn’t want to or doesn’t think that our lives are worth the price of them policing our current tire policies. I have four studded tires for winter and ‘all season’ (three-season tires, they are not winter tires) for the rest of the year. I also carry tires chains made from logging truck chains for my pickup in case of an emergency. So no tolls, but real chain control will save lives and money. The money saved by ICBC will more than pay for the two extra officers needed at each end of the highway during chain control or adverse driving conditions. I’ve driven the Coquihalla Highway during a blizzard and never saw an RCMP. That is not acceptable. All semi’s need chains to pull the hill from the snow shed to the old toll booth area during any snow storms, period! No exceptions. Chains, winter tires, slower speed and common sense! Tolls or no tolls – we may need enforcement of tires and chains and speeds and that folks need to learn to slow down/drive for road conditions. They shouldn’t need s sign to tell them how fast the right speed is: this will vary for different drivers, vehicles and tires. As a 4WD driver, I find the comment on SUV speeds funny – I cant count the number of times a 2WD vehicle passes me on the highway, later to end up off the road. Everyone needs to slow down for conditions. We’ve had some milder winters for some years and it seems folks are forgetting how icy conditions can be and/or they are simply in too much hurry. Erratic conditions will be the norm as the climate changes. We are all paying the price in insurance fees and injury rates. Privatization of maintenance has not saved us any money over the years, only cost us in a different way. I believe there is a large proportion of rig drivers and others who have never driven the mountain passes before and do not know how to do it safely. Many are too tired to drive and should be timed out after 12 hrs.More emergency pullouts should be added. I think Mr Cambell’s suggestions are right on the mark.Speed limits must also be lowered but doubly so in snow or fog /ice conditions. The incidence of accidents is related to speeds. Just10 days ago, we were overtaken by a pickup truck heading down towards the snow shed. It was travelling at least 115kph on this – the steepest descent on the route. Seconds later, the rear swung out and the left front corner struck the curbing. Then it slid sideways along the road at the same speed,crossing three lanes and then pinwheeling off the curbs on the right side before eventually coming to a stop. The lit sign showed a speed reduction to 90 kph in this zone. Photo radar on these speed reduction zones, plus more speed and tire compliance patrols is what’s required. The maximum limit should be returned to 110 kph. A few winters ago I passed a semi installing chains just uphill a few hundred yards from the snowshed. His rig was slowly moving backwards as he was chaining up. I use the best snow tires available for my vehicle, an 01 Impreza, it’s great. How, exactly, is the toll going to change things? The suggestion of stepped up enforcement is the only way things will change on that highway. If the toll is spent on enforcement and maintenance….I would be happy to pay it. However, if it goes into general revenue (which it probably will) then things will not improve. Variable speed signs that are actually enforced, winter tire laws that are also enforced and chain up rules that are also enforced are the only way to change the disaster that highway is becoming. Additional enforcement, maintenance and emergency response would have to be paid for. Tolls — designated for the purpose — would be one way of paying for them, and making sure they don’t lose out to other budgetary items from year to year. The introduction of the profit motive into highway maintenance is one of the worst ideas foisted upon us in recent memory. You are right. All this model does is force companies to cut, cut, cut ( staff & equipment ) in order to maintain a profit level. Highway travelers be damned. You said it perfectly, Mr. Campbell. I do the complete tire change also on all my vehicles. Serious winter tires studded for winter and regular all seasons for summer only., plus my trucks are 4 x 4. We have the teeth in the law about winter driving, chains or winter tires, but no jaw bone to do anything with them. Maybe because the authorities don’t have REAL winter tires. The reality is that people just drive too fast in the winter. Those with 4 wheel drive SUV’s and trucks think they were built to do 120 kph in the snow! REALLY!! The answer is a winter speed limit and getting back to photo radar to enforce it! The winter limit needs to be 90 km/h or less when there is snow on the roads. Why the toll came off in the first place, we were all used to paying it. Very good points. I do think Mel’s suggestion for toll charges was to pay for better road maintenance.